Located near the intersection of Parkshore Dr and Folsom Blvd, Extra Space Storage serves residents of Folsom, Alder Creek, Nimbus, Orangevale, Gold River, and more. Locals will recognize our facility north of Out of Bounds Craft Kitchen & Biergarten and The Waffle Experience. 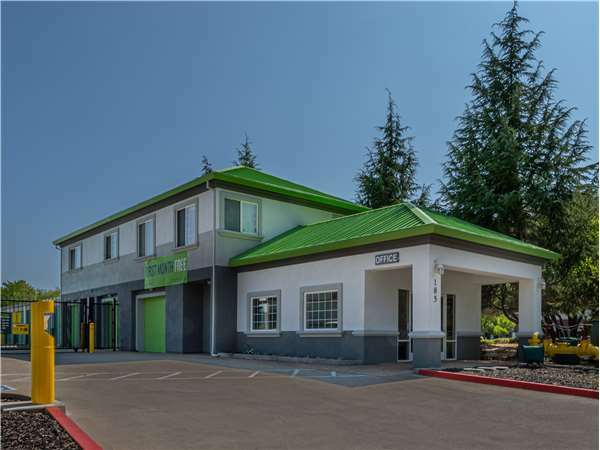 With a wide range of storage units, climate-controlled storage, drive-up access, and exceptional security, Extra Space Storage on Parkshore Dr is the self storage partner you can trust in Folsom! Our Parkshore Dr storage facility has units ranging in size from 4x9 to 10x30 with indoor access, first-floor access, drive-up access, and elevator access. No matter what you need to store, we have the unit for you! With excellent security measures like an on-site resident manager, individually-alarmed units, 24-hour video surveillance, and electronic gate access, you can store items with confidence at Extra Space Storage. Keep delicate items safe from extreme temperatures in a climate-controlled unit! These units stay between 55 and 80 degrees at all times to protect your belongings from heat, humidity, and cold year-round. Our Folsom storage facility offers convenient drive-up storage units to make storing large, heavy items easier. Simply pull a vehicle up to your unit to move items in and out without hassle. Drive-up units can also be used as a garage-like space for small vehicle storage. With a clean, secure, well-maintained facility and a friendly, professional team, it's easy to see why customers trust Extra Space Storage with their residential and commercial storage needs. We go the extra mile to ensure you have a dependable self storage and an incredible experience. Contact us today to reserve a storage unit in Folsom! Sean is very easy to work with and very thorough. We received a great price on our unit. The facility is clean, well maintained, and has good security. We researched several storage locations in the area and are very happy with our choice of Extra Space on Parkshore Dr.